Wonder Woman is quality popcorn entertainment with ambition. It is not the exception to the rule and it certainly has its issues, namely with pacing and its generic and derivative climactic battle, but much of this is easy to forgive due to that ambition; due to the fact it is earnestly trying to be more than it has to be. It has been a rather long time coming, but the day is finally here that we have a big screen, feature-length version of Diana Prince’s origin story. Director Patty Jenkins (Monster) has crafted a magnificently mounted piece of filmmaking that feels as grand and majestic as a Wonder Woman movie should. It also doesn’t hurt that the casting of our titular heroine couldn’t feel more right and kudos to Zack Snyder for trusting his instincts on such a decision despite the initial backlash the casting and costume of Gal Gadot received. As Prince, Gadot is endearing from the moment we see her desire to uphold the legacy of her people. This initial gracing comes as she trains for an ever-impending battle that threatens to destroy her hidden island of Themyscira and the fellow Amazons that live there with her. Though unfamiliar with the comic books or even the seventies TV show starring Lynda Carter I’ve always assigned Wonder Woman to be this kind of beacon of purity in the super hero universe. Besides this though, I wasn’t sure what, as a hero, she stood for or what her motivations were or what her history entailed that might have made her so driven to defend the world from the bad guys. Turns out, Wonder Woman is more or less a God the same way Hercules was. Maybe even more so; is Hippolyta (played here by Connie Nielsen) more God-like than Alcmene? I have to imagine so. While Jenkins’ Wonder Woman provides enough of the backstory and origin details to answer many questions that might pop up throughout what is most impressive about this latest DC Extended Universe film is that it keeps to the virtues of that character throughout in the way people fondly remember. Jenkins and scribe Allan Heinberg have actively kept Wonder Woman’s optimism and slight naivety intact while placing her in a world and time that is tangible and rather terrible, not to mention under-represented on film. Such is a testament to how well Wonder Woman finds the right avenues to take in order to balance the many ambitions it hopes to accomplish. Even if some of these aspirations don’t quite reach the heights as successfully as was hoped for it is that balance that is key as there is so much to admire and enjoy about Wonder Woman that it not only remains memorable, but affecting. 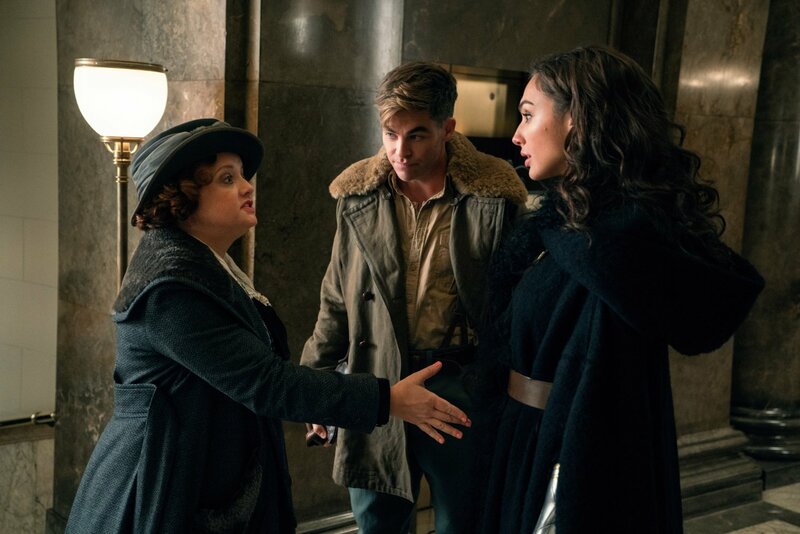 Etta (Lucy Davis) and her employer, Steve Trevor (Chris Pine), help Diana Prince (Gal Gadot) acclimate herself to London. While the film begins by re-introducing us to a modern day Diana Prince who now works at The Louvre managing what looks to be a department hell bent on locating artifacts from if not the location of Themyscira it quickly flashes back to Diana’s childhood thanks to a message from none other than Bruce Wayne himself. While Ben Affleck’s Caped Crusader remains off screen the connective tissue to the DCEU films is stated right off the top. The package contains the original photo that was found in Batman V. Superman leading to several questions for both Batman and the audience as to where exactly this mysterious woman originated. Well, if you’ve been waiting for such answers for over a year at this point-you’ll be relieved to know Wonder Woman is essentially a guide to everything you could have ever hoped for in what was largely the only point of agreement around Dawn of Justice. Beginning with Diana as a young girl who is forced to look on as her Aunt Antiope (Robin Wright), who happens to be the greatest warrior among her people, trains fellow Amazons to be warriors she longs to join them. Diana has been shielded by her mother though, and is not allowed to participate. Hippolyta reinforces the fact Diana is different and that she doesn't want her trained, but why such a decision has been made is kept vague. Hippolyta tells the young Diana that she is her most prized possession and that, after Zeus saved the Amazons from the wrath of man and particularly his son, Ares, she prayed for him to bring her a daughter. Diana is told she was sculpted out of clay and brought to life by the King of the Gods (so, ya know, no pressure). As Diana grows older her desire to defy her mother naturally grows as well and while she convinces Antiope to train her in secret it seems even Antiope is taken by surprise when Diana does in fact surpass her as the greatest warrior on the island. It is only as Diana comes into her own that she witnesses a plane crash landing just off the coast of Themyscira. The only person aboard turns out to be Steve Trevor (Chris Pine), a British spy who has stolen a coveted notebook from Dr. Maru AKA Dr. Poison (Elena Anaya) and her superior officer, the despicable General Ludendorff (Danny Huston), who Steve tells Diana and the rest of her people have started the war to end all wars. Naturally, this prompts our hero to leave her home and seek out her destiny. Heinberg certainly follows guidelines that have been laid out for him in the past in order to craft an origin story worthy of Wonder Woman's first feature-length appearance, but Jenkins with her ability to balance so many facets of so many factors transitions from each of the many different things Wonder Woman is with seamless ease. Beginning on Themyscira as some type of weird sci-fi flick and then switching gears to not only become a war film, but a romantic drama of sorts as well as a fish out of water comedy only to then culminate in something that brings all of these strands together to make some sort of sense is rather impressive. It's a tall order and one we've seen attempted countless times before, but somehow much of what is thrown at the wall here sticks and even better-it doesn't feel like Warner Bros. or the DCEU were simply throwing things at the wall and hoping for the best, but instead Wonder Woman is the first film sans maybe Man of Steel in this newly minted cinematic universe that feels like the product of a single group of artists. Sure, Snyder and Jason Fuchs (Pan) contributed ideas to the story, but ultimately this is a film that is the product of a single screenwriter and a director who clearly had a certain vision rather than that of the WB board room. Within as much, Jenkins is able to use such archetypes of the genre to her advantage by implementing and building themes and ideas that give the plot more substance than that of just another super hero story that takes us from one expected beat to the next. Diana Prince, Wonder Woman herself, is someone who is both very confident in her ability to fight and defend-she never questions her instincts and is never afraid to speak her mind-while at the same time coming into a world and a war that she knows very little about and understands even less of. 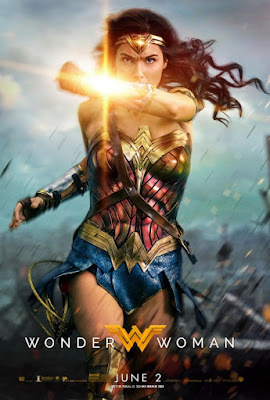 While Gadot's performance does a lot of the heavy lifting in order to convey the right measure of such confidence and such innocence it is the film that deftly handles the reality it must bring to the forefront of its heroine's mind by way of the fact all men, all humans in fact, are neither all good or all bad, but complicated, complex, beings whose promise is not measured by their mistakes, but by their hope and effort to be better. That Jenkins is able to bring actual ideas and convictions through as big and loud a film as Wonder Woman is quite the accomplishment and while, again, these aren't new ideas by any means the film lends them a certain pedigree and serves them as a reminder of how powerful sincerity can be. 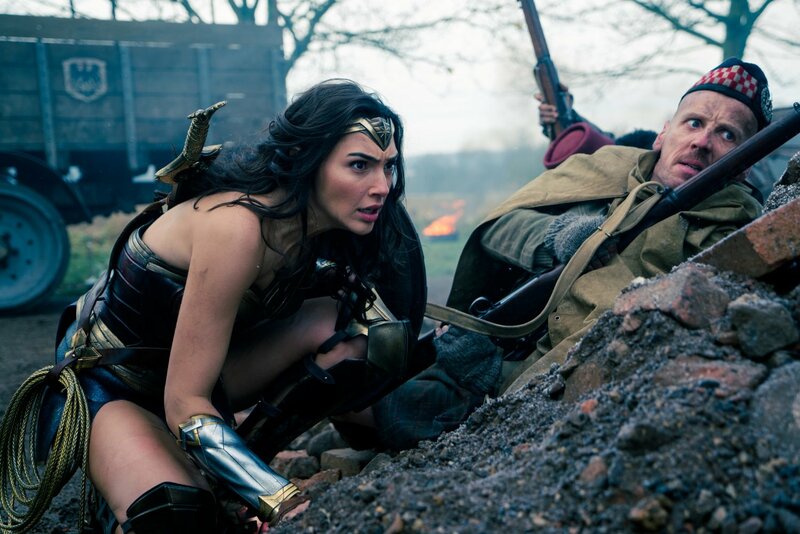 Gal Gadot's Wonder Woman readies herself for battle alongside Charlie (Ewen Bremner). As hard as it is to support the tropes of old fashioned comic book movies with satisfying ideas and character arcs what seemingly proves to be even more challenging in many of these films is that of getting those tropes right. The action, the love interest, the villains-they're easy to relegate to the back burner because they're givens of the genre, but Jenkins at least attempts in many of these aspects to have them accentuate the type of super hero story she is telling. It is in the action that Wonder Woman most closely resembles her DCEU counterparts, but while the film enlists the slow motion techniques perfected by Snyder a decade ago it is Gadot and the style with which Jenkins captures the physicality of her performance that allows these action sequences to stand out in a way that gives birth to some rather monumental moments. Chief among the three major action scenes that take place is the one in the middle of the film where we see Gadot's Wonder Woman rise out of the trenches revealing herself in full Wonder Woman regalia for the first time, It is the culmination of an hours worth of character and momentum building that earns this moment of the first big screen female super hero being the only one capable of walking through "No Mans Land." Furthermore, though the climactic battle is very much in the vein of what we saw in Dawn of Justice the way in which the antagonist is handled, the way in which the villain is more represented as this kind of entity of evil throughout the film rather than it being pinned down to a certain bad guy's particular plan for the sake of an archetypal bad guy is kind of inspiring. Don't get me wrong, the film has to have a big third act CGI-fest because it is a comic book movie and those are just the way these things go, but while the stakes don't feel as grand or as heroic in this final battle as some of the earlier ones do we still very much care about the outcome because we are more than invested in these characters. And we're invested in these characters largely due to the fact both Gadot and Pine are giving pitch perfect performances for the movie and roles they're filling-making the several tones Wonder Woman must juggle feel like the film is never juggling anything at all. Even more appreciated is the fact the film never condescends to men while still empowering women. Steve Trevor is very much the love interest, but he's not a damsel in distress. More, he is the support Wonder Woman needs as she comes into our world and Pine's performance remains as much even as he acts heroically in his own regard; both of them carving out a path of genuine sympathy and a surprising, but strong sense of satisfaction by the time the credits roll. Wonder Woman is a smart, strong, and charming character and thankfully her first feature film shares those qualities.